Our fishing has been on and off. The best has been between Cape Verde and Caribbean.. Green Lures, long way back have been the best. Sometimes the fish have taken anything over the back. Its awesome to see a large Mahi Mahi change cause and take a lure as we sail down a wave. They can change direction surprisingly fast. Hand lines and poppers have also been used but even with bungies tend to loose lures and line when something big takes hold. The fishing pole with variable tension is the easiest and most successful kit we have. At present the green squid lures with a clear head and big eyes are working well. They are 5 cm long and have caught two Barracuda and two Dorado in the last week. We have hooked 3 big Tuna and landed one. For us a big Tuna is about 40 kg and 3 to 4 foot long. Typically we are down wind sailing and have found hand lines with bungy can't catch these big fish. The locals in Tahiti are using 2.5mm mono filament which is like strimer line. Our protocol when the reel starts to spin and sing is to go the line and increase the tension as far as you think you can and still keep the rig. Nicole and the kids bring in the sails and turn into wind with the engine started. Then Nicole follows the fish by me saying where it is by the direction of the line going into the deep blue. as it gets close we swap and I take the gaff. Nicole brings the fish to the side of the yacht and when the swell brings the fish within reach I gaff it and haul it over the life lines. Friends from Annapolis came to Guadaloupe for a week and chartered a 42 foot catamaran. We thad one day into 20 knots head wind and one down wind day sailing with them. Into wind and waves we sailed as fsast but their leeway left them several miles behind after 20 miles of tacking into wind. Down wind with 2m waves they did better. We made the mistake of going down wind vs gybing at 150 degrees which is our fastest down wind angle. Interestingly they found the catamaran did move so the "wine bottle on the table while sailing" myth was dispelled. How it did have less movement over all and is easily more stationary when at anchor. As for living space at anchor there is no comparison, everyone ended up o the cat. Using people referred to us has been the most reliable. In St Barts we had an interesting time finding a mechanic to look at the generator heat exchanger. The first shop obviously where busy cleaning and polishing vs doing real mechanical work. Then we went to Hugh Marine, the shop was white and spotless with CNC machines etc. Hugh looked at the heat exchanger like he had seen one before and preceeded to diagnose it like an expert. No excuses or shaking of the head. We watched while he found the fault, told us how to fix it. Also in Antigua we used an Marine engineer from Small Ships Surveys and he helped organize all the other labour to replace a rudder bearing. Having a qualified local really helped get good quality people and the yacht worked on to the quality it deserves. We sail Wing on wing- main out to leeward and poled out genoa to wind, plus a cutter to leeward. We sail 150 degrees apparent wind. This is well balanced and reefing is easy. 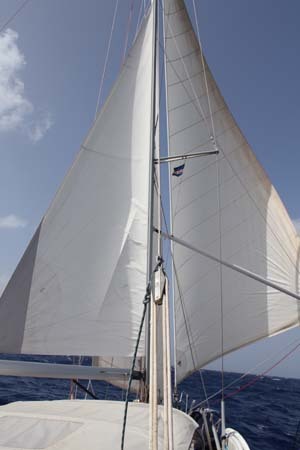 Others have para-sails or twin head sails. Everything seems to work well for each yacht. The spinnaker and para sails have tended to be taken down at night time. One para sail has split up the center and the other pulled out the deck fittings on the catamaran it was on. Palma - a large yachting industry once you get connected. Las Palmas - they are in the marina and north in the commercial zone. Martinique - Le Marine - Access to everyone is by dinghy. Automated Identification System uses VHF channel 87 and 88. The system automatically calculates how close other ships will get and when. This is a huge safety factor as the ships appear on your chart and let you see what their name is so you can call them on the radio. I consider AIS a must have for cruising. Turn it off when in dodgy possible pirate seas. In Cape Verde our chart plotter told us we were 3 miles in land. So we checked on the PC and smart phone. All confirmed our yacht was happily sailing through a 1,000 foot high mountain. This reminded us to always check lights and radar when approaching land. It will be interesting to see how accurate the pacific islands are on the chart given some have not been navigated since Captain Cook. Modern Chart plotters and a single bus ...or point of failure..
Several people have had problems with autohelms and chart plotters. At present it looks like all the manufacturers "networked" devices crash. At present I am happy that we have 3 separate systems 1. wind/depth 2. Chart /radar 3. Autohelm. A Gori prop folds to reduce drag when sailing and also has two pitches, the over drive pitch is entered when in reverse. This gives us 7 knots speed at 1300 rpm and halves the diesel consumption. Down side is it has two zincs to look after the moving parts.The rubber bumpers wear out abotu every 3 months with constant use. As of July 2016 we have swapped them for a new black rubber version from Hallberg Rassy and they apparently will last longer. Cruising shouldn't need email, but hmm... it does. Between downloading weather, uploading pictures and calling family most sailors are on the look out for free or fast internet. Anchorages are shared with internet before good holding ( the surface the anchor has for purchase). There are several WIFI antenna system which give a better range than your phone or laptop, these let all the devices on board log into one WiFi while the booster logs into the local bar, hotel, marina or pay-to-use wifi.